Image Size: 11 X 18 in. 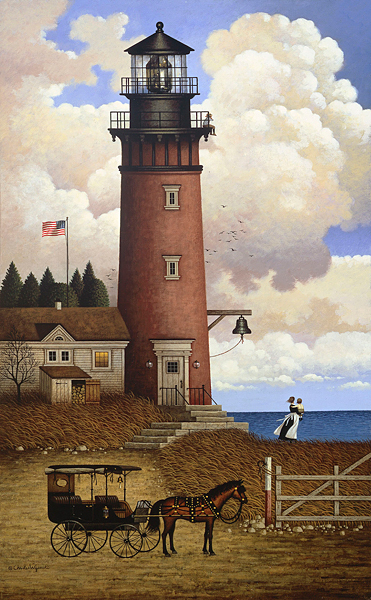 “In my paintings, I want to hit every emotion I can from the sublime to the silly,” Charles Wysocki said. The love of life, with all its wit and wisdom, poetry and emotion, sights and sensations, is captured in his paintings. “There is a simple message in my work,” Wysocki said, “and it is love.” Daddy’s Coming Home tells a universal, yet deeply intimate and emotional story. We all have shared the same feeling, whether it is at the end of the day, the end of a business trip or even deployment overseas: the anticipation of seeing your father again.